In 2009 Update (the computer club at Uppsala University) got a mail from Stacken (the computer club at KTH in Stockholm). It was more or less a distress call, Stacken was unable to keep a storage room and that some nice hardware was in danger of being thrown out. Update answered and took a decdatasystem 570 (Helena) under its wing. It's really a PDP-11/70 in a blue wide cabinet. Also in the storage space was two DECSYSTEM 2020, serial numbers 4160 (VENUS) and 4280 (NADJA). Along with them was a lot of peripherals. » Helena and NADJA at KTH. Both NADJA and VENUS were originally with the Departement of Numerical Analysis (NADA). 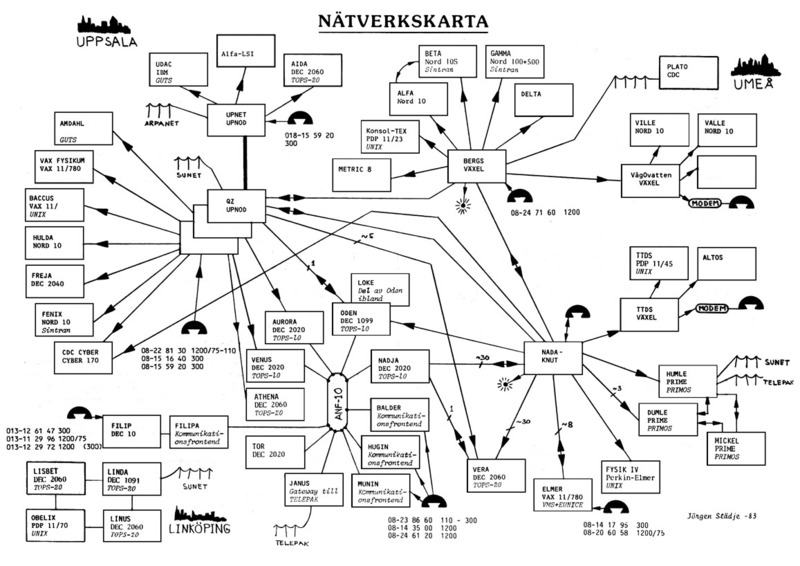 Both machines are visible on Jörgen Städjes network map from the time. NADJA and most of the peripherals was kept by someone at KTH and NADJA was actuallly started not long after. I think the source of the final TOPS-20 version of the Swedish game classic "Stugan" was found on one of NADJAS disks. Some of the game was actually written on NADJA and NADJA is mentioned in the source code. VENUS however was moved to the basement of Update member Bjarnis mothers house. And has been waiting there until now, because today I rented a truck and hauled VENUS to my garage with hopes of bringing her to life once a gain. Together with VENUS came a RM80 fixed disk drive and a TU77 I picked up in an earlier haul. Then I dropped the kid off at the babysitter and picked up Bjarni and vol to assist. It's never a dull moment with these two, half the fun of hauling computers is the ride. Together we picked up the rental truck, way too big for the purpose but you really need a tail gate lift. Arriving at Bjarnis mother we navigate down to narrow slope to the far side of the house. Inside VENUS waits besides Bjarnis Eclipse S/280 under some protective plastics. It's a nice reunion. »VENUS and Eclipse S/280 under plastic protection. Next we prepare the move. Some boards and stones even out the grass we have to pass over. Remind me to tell you the story when we moved the Eclipse down a grasscovered slope that tilted in several directions. This was the only real obstacle, a narrow door with a high threshold. We removed the plastic cover because we kept slipping our grips. »VENUS on the way out. There, VENUS in the truck. This was one of the easier hauls overall that I've done, completed in under four hours with no major setbacks. And the RM80 and VENUS neatly fastened to the truck with padding agains the walls and straps. »VENUS and RM80 strapped down. The trickiest part of the trip was aligning the truck and its tail gate lift with the garage door, there is just about two inches to spare and the lift must _inside_ the garage to be on top of the floor. Unloading went smooth as well. There is a slight slope to the driveway so we always had someone stopping the cabinets from moving when the straps were removed. I returned my fellows Bjarni and vol to their home and picked up the KS10 PSU that Bjarni kept separate in his room.